Round (or Radial/Barrel)- Great for shorter hair to give some volume, or fab for longer lengths to create soft loose waves. For short hair take small sections on the crown and blowdry up and out, curling under the brush. Hold the brush in the hair for a few seconds without the heat from the hairdryer to help the hair to set. You can get different sizes of round brush so depending on length, smaller for shorter, larger for longer. 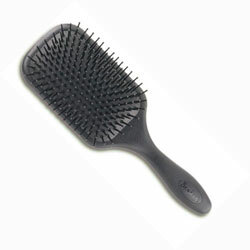 Paddle - Probably the most popular brush. Mainly used on mid length to long hair, but is great for short thick hair. Smoothing the hairs cuticle creating great shine, hold hair on top of the brush and blow dry sections in a downward motion. Vent - The speediest number in town to dry hair. 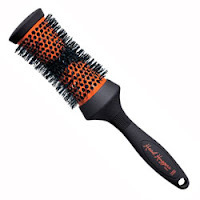 Vented brushes let the air circulate through the hair and can be used to achieve great volume. Can be used on any length of hair - wouldn't recommend curly hair as it can result in a tangle disaster. All brushes I've used in pictures are from the Denman range, I really love their brushes, long lasting, hard wearing and they have even started doing a "scent" range on their website. Coconut hair anyone?! Great post, I love the sound of coconut scented hair! Thanks for your kind words and thoughts, Kel. It appears I'm using the right brush for me!!! yum coconut hair!! 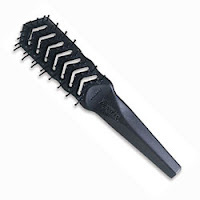 i cant live without my round wire brush otherwise my hair would never dry! I think I may have to invest in a coconut brush just to roadtest for you guys, I'd imagine it'd be yummy. Glad you all seem to be using the right brushes - I couldn't believe after going to a round brush how much "poofier" my hair was! !